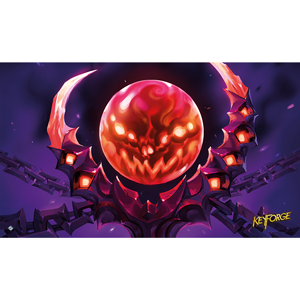 Field your cosmic clashes on the Crucible in style with the Machinations of Dis Playmat for KeyForge: Age of Ascension! Whether you are playing in a high-caliber tournament or around the kitchen table, this high-quality rubber-based playmat presents your cards in stunning fashion with vibrant art from the world’s first Unique Deck Game. This 24” x 14” mat provides the perfect play surface to protect your cards from stains and spills, keeping the focus on your adventures in the Crucible. Displaying a bewitching art piece to embrace your Dis pride, this mat keeps your battles organized and immersive.